HISIRIS has been studied in order to treat sensitive skin in all its different categories and manifestations. sensation of discomfort, intolerance to external agents, fragility, dark spots, loss of elasticity. Specific line designed for sensitive skin with a constitutional tendency to develop irritative or allergic reactions. Designed to interrupt the inflammatory “vicious-circle”, Hisiris Pro Dermis home care products are also ideal for your daily beauty routine. Every single home care product has important soothing and deep hydrating properties, perfect to calm down the inflammatory process and protect the irritated skin. A specific group of products designed to reduce the visibility of blemishes associated with couperose. Couperose is a blotchiness of the skin characterized by capillaries dilation and red-purple colour mostly localized in the nose and cheek area. 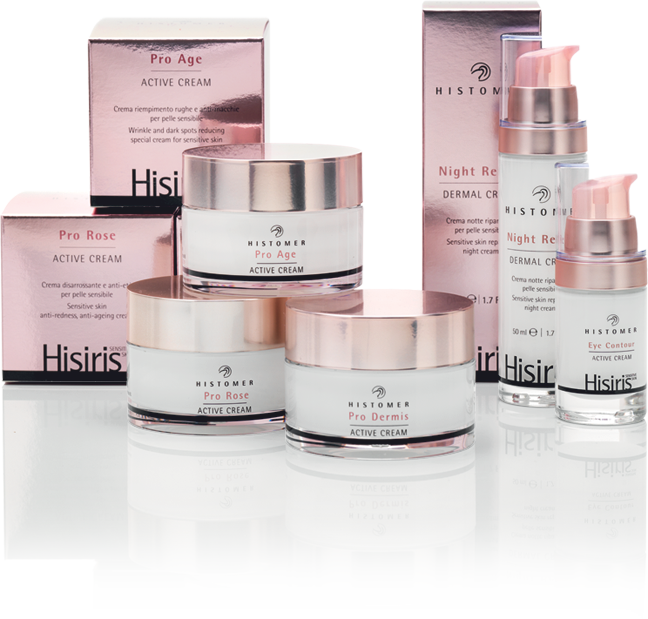 Hisiris Pro Rose products represent your best ally in order to counteract couperose and all capillaries dilations. This line includes a wide range of products specifically dedicated to mature and sensitive skin. A daily beauty routine absolutely necessary to prevent, protect and prolong the face vitality, immediately fighting against signs of skin ageing.